The role of forward-looking activities for the governance of Grand Challenges: Insights from the European Foresight Platform. LA PROSPECTIVA ES UN INSTRUMENTO PARA FORMULAR, Y LLEVAR A LA PRÁCTICA, POLÍTICAS DE INVESTIGACIÓN E INNOVACIÓN. POR ESO LAS ACTIVIDADES SE HAN CONCENTRADO EN LA ESCALA NACIONAL: LOS GOBIERNOS BUSCAN DEFINIR PRIORIDADES, CREAR REDES ENTRE LA CIENCIA Y LA INDUSTRIA, Y MODIFICAR SU SISTEMA DE INVESTIGACIÓN Y CULTURA ADMINISTRATIVA. LA PROSPECTIVA SE HA EMPLEADO COMO UN CONJUNTO DE HERRAMIENTAS TÉCNICAS CON MIRAS A UNA VISIÓN COMÚN PARA ATENDER PROBLEMÁTICAS DE LARGO PLAZO. 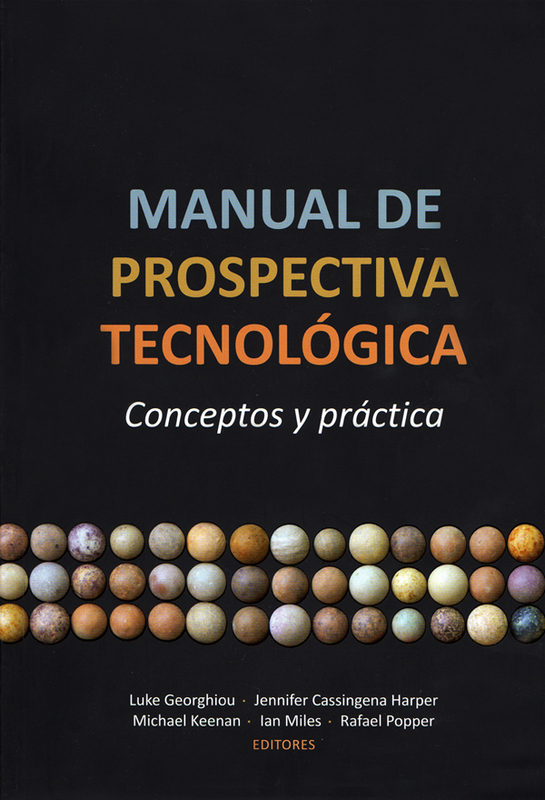 EL MANUAL DE PROSPECTIVA TECNOLÓGICA ES UNA OBRA CRÍTICA Y EXHAUSTIVA QUE COMPENDIA CAPÍTULOS DE ANÁLISIS TRANSVERSAL QUE BORDAN EL SURGIMIENTO Y POSICIONAMIENTO DE LA PROSPECTIVA, ENFOQUES Y MÉTODOS COMUNES, CUESTIONES RELATIVAS A SU ORGANIZACIÓN Y EL MARGEN PARA LA TRANSFERENCIA Y LA EVALUACIÓN DE POLÍTICAS. EXPERTOS Y PROFESIONALES EN EL TEMA ANALIZAN LAS EXPERIENCIAS DE LA PROSPECTIVA EN AMÉRICA, ASIA Y EUROPA. SE TRATA DE UNA LECTURA OBLIGADA PARA RESPONSABLES DE LA FORMULACIÓN DE POLÍTICAS QUE NECESITEN PONDERAR LA PERTINENCIA DE LA PROSPECTIVA, ENCARGAR UN EJERCICIO DE PROSPECTIVA O ESTÉN INVOLUCRADOS EN SU APLICACIÓN PRÁCTICA; ES UN LIBRO PARA EMPRESAS ÁVIDAS DE PRACTICAR LA PROSPECTIVA PÚBLICA, Y PARA ACADÉMICOS E INVESTIGADORES INMERSOS EN LOS ESTUDIOS DE FUTUROS, Y LAS POLÍTICAS Y GESTIÓN DE LA CIENCIA, LA TECNOLOGÍA Y LA INNOVACIÓN. …a systematic process aimed at assessing the appropriateness and level of achievement of the programme’s objectives, its performance (using cost-benefit analysis), efficiency of organisational structure (i.e. approaches and methods) and effectiveness of implementation and aftercare. The process should assess the level of capacities and Foresight culture achieved; its national, sub-national and international reach; level of commitment of participants; and novelty and impact of its internal activities (i.e. studies and projects). In addition, with the aim of aligning a Foresight with the implementation environment, the evaluation should try to measure the impact on public and private policies and strategies; agendas of science, technology and innovation (STI) programmes and institutions; consolidation of research groups; consolidation of S&T capacities; and internationalisation of R&D. 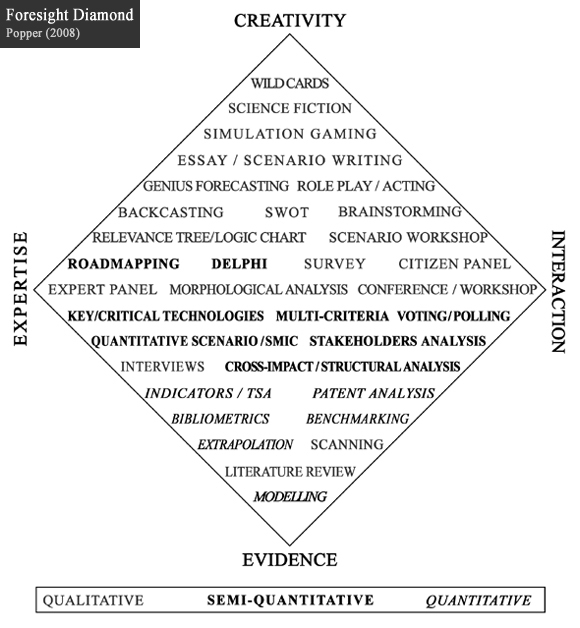 Finally, a fully-fledged evaluation of Foresight should also identify new products and services; new policy recommendations and research agendas; new processes and skills; new paradigms and visions; and new players.